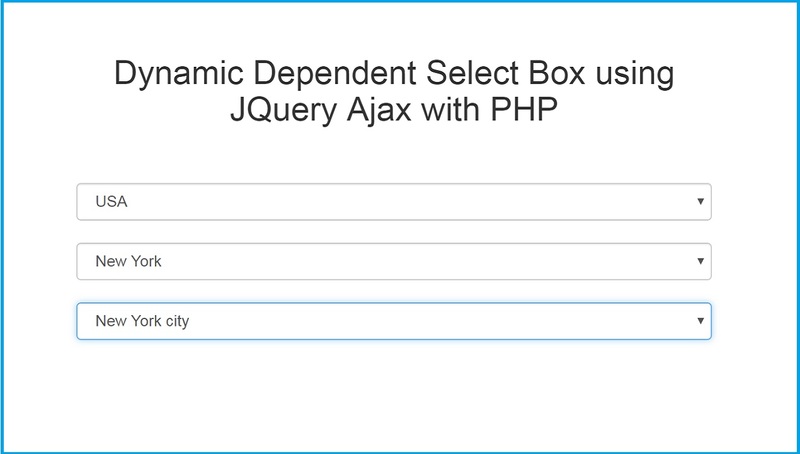 In this tutorial we are going to learn dynamic dependent select box using jquery, ajax and php. This type of feature mostly use if you have use Country State City or you have working with Category and you want to load Sub Category of particular category. At that time this feature is very useful. But Here we have take an example of dynamic dependent drop down list box of Country, State and City. Here State data has been dependent on selection of Country. So when we have select particular country then in state select box we have load that country state only not all country state. Same as City data is also dependent on selection of state. So when we have select particular state then in city select box it will load only that state city only. So It will help us to filter records from large amount of records. Hi Thanks for the simple tutorial. Just have a quick one. How can i insert a country name and state name into the table? right now its showing the country and state IDs.